The illustrations by my client, Annika Nelson, are vivid, fun, and creative. Annika works in collage and does a fabulous job bringing this imaginative theme to life. Originally published at www.apatchworkofbooks.comI always appreciate finding new books that speak about differences between children in a thought-provoking, yet age-appropriate way. The beautiful collage illustrations in this one, paired with verse that offers questions surrounding color. "If flowers had no colors, would they smell as sweet?" and "What color am I to the moon? What color am I to the sea?" 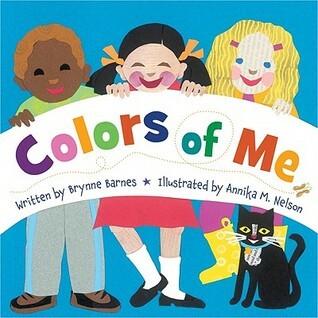 are great examples of how the book not only questions what skin color means, but also what color in general means, in a manner that even toddlers can understand.The illustrations are fabulous and though I'm not familiar with other work by Nelson, I'll definitely be seeking her illustrated books out. My Review: A playful rhyme book celebrating the colors of the world by questioning whether the rain has a color to does the grass knows if it’s green? And if the rain doesn’t think of our colors when it falls on our head then why do we have questions about race, ethnicity and diversity? Does a child know which color is important? NO! Like the author mentioned, “The whole world is full of colors just like you and me.” Illustrator Annika Nelson used bold colors to bring this book to life. I highly recommend this book for classroom teaching.FTC Disclosure: I received a review copy of this book in exchange for a fair and honest review. I was not monetarily compensated for my opinion in any way. This is a subtle multicultural celebration that reminds me of The Important Book, one of my all-time favorite children's books. It poses several thoughtful questions about the salience of color in the natural world, then crosses over to consider similar questions in the social world. I can see this book serving as a great launching point for discussions in science (ex. does color matter to birds? ), social studies (ex. how important are people's different colors?) and the arts (it's chock full of great color vocabulary). Another fine Made in Michigan title! I like the concept of this book very much. The collage illustrations are bold and colorful--very nice. The whole world IS full of colors!...a beginning look at diversity. This book is for younger age children, but it does an excellent job of teaching about diversity and the different skin tones. It is fun and entertaining to read. It is a great introduction to share to students no matter our skin color, we are all the same. What a great, and colorful, book about being beautiful - no matter what color your skin is. Apparently you need to learn from crayons what color you are because the world doesn't tell you before you get a chance. Post-racial fantasy for children parading as informative.